[Resolved] Single background image for whole page including header? Home › Forums › Exoplanet Pro › Single background image for whole page including header? This topic contains 6 replies, has 2 voices, and was last updated by Motoman 9 months, 2 weeks ago. 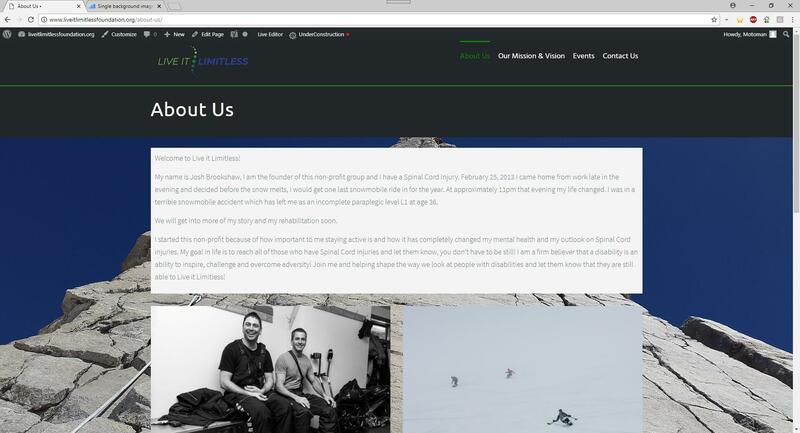 Is there a way to have just a background image that shows top to bottom on the page, as opposed to having something different in the header area? I’d like the header area to just be transparent and have the background image visible throughout. Yes, the header area can be made transparent so the background image will show through. 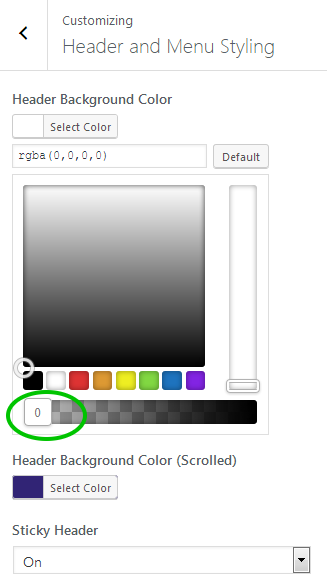 In the customizer, go to ‘Header and Menu Styling’ and in the setting for ‘Header Background Color’ slide the transparency setting all the way to the left to 0 (zero). Setting this to zero will make the header transparent across the whole site. Thanks for that…actually, I’d want it to be as it is on the home page, but transparent everywhere else…could I do that? In that case, set it to zero, and then for the homepage change the transparent part of the Additional CSS code for any color you like. in the rgba example the 1 at the end controls the transparency (0 is fully transparent and 1 is no transparency, so 0.5 would be half transparent). Thanks, that seems to be pretty close…but where the header was on non-home pages it shows as a gray bar now…doesn’t show the background image through…? This reply was modified 9 months, 2 weeks ago by Motoman. Ahh yes I see what you mean now. I initially assumed it was the homepage image that you wanted to show through, but I can now see it is the body background image that you need to show through the site header. The topic ‘Single background image for whole page including header?’ is closed to new replies.